The Boontown Rats once told us that they didn’t like Mondays and like Garfield craving a big ole lasagna I am right there with them unless the Monday in question features news about an upcoming North American tour by the mighty Megadeth. Yep, that is just how my day progressed and I’ve copied the official press release for your own indulgence but will return afterwards to discuss it with you. MEGADETH has announced today the details for the North American leg of their Dystopia World Tour, which will kick of in Dallas, TX on February 20, 2016. The North American leg will take them across the U.S, visiting 12 states and throughout Canada. 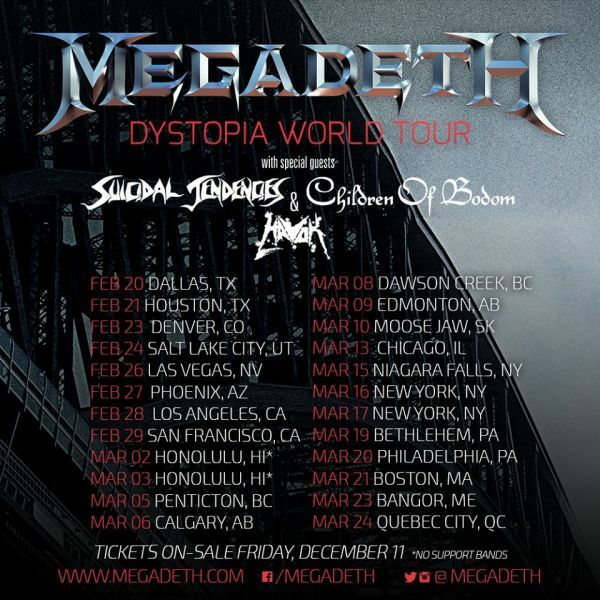 Tickets for the Dystopia World Tour start going on sale Friday, December 11; Check http://www.megadeth.com for specific market info and local on sale times and dates. There will also be an exclusive pre-sale for MEGADETH fan club members on December 8 at 10:00 am local time with details also available at http://www.megadeth.com. MEGADETH will be on tour in support of their new album Dystopia being released on Universal Music Enterprises /Tradecraft / T-Boy Records on January 22, 2016. Along with band visionary Dave Mustaine at the helm, MEGADETH’s current touring lineup will be Kiko Loureiro (formerly of Angra) on guitar, David “Junior” Ellefson on bass, and drummer Chris Adler (Lamb of God), all of who are featured on the new album. Joining MEGADETH on the North American leg of the Dystopia World Tour are very special guests Suicidal Tendencies, Children of Bodom and Havok. *Suicidal Tendencies, Children of Bodom and Havok will not be on these dates. MEGADETH burst onto the scene thirty years ago, virtually inventing a genre with their debut album Killing Is My Business… And Business Is Good! (recently recognized by VH1 as the Greatest Thrash Metal Debut Album of All Time) sold more than 38 million albums worldwide, earning numerous accolades including 11 Grammy® nominations, scoring five consecutive platinum albums—including 1992’s two-million-selling Countdown to Extinction. PiercingMetal Thoughts: A new tour by the band Megadeth is exciting news on its own because as a band they always deliver a crushing set. I’ve seen the band about ten times over the course of the last decade or so and they have never disappointed me. I just saw Kiko when he came through town with the band Angra a few months ago and can safely say that his guitar acrobatics are going to startle you. Drum wise I can offer up only praise for Chris Adler who is one of the most groove-tastic Metal drummers on the scene today and his style is going to greatly enhance the sounds of the classic Megadeth tunes. Now let’s go over the lineup on this particular tour and I’ll begin with Suicidal Tendences. Growing up I was always more of the casual fan than the diehard one but they give a great show and that has not changed over the years to the best of my knowledge. I’m a big fan of Children Of Bodom but fear that being so early in the night will get them no longer than a 45 minute set and having seen Bodom a lot as well can attest that the momentum is just beginning to boil at that point. Havok might be the newest name for many fans and yes I have seen them also and they deliver a traditional Thrash vibe with a modern assault power and I feel those longer tenured Megadeth fans will like them quite a bit. I am also happy to find two nights in NYC being the case because the Big Metal Apple would settle for nothing less. What do you readers think about the new tour announcement and its lineup and how excited are you for the new album? Let me know in the comments section, I’ve left the light on for ya.